There is no single date marking the beginning of what is now known as Bryker Woods since the neighborhood is actually a composite of many small subdivisions (and some resubdivisions) which were platted at different times. The origins of the neighborhood can be traced at least as far back as 1886 when the fourteen-lot William Thiele subdivision was platted within a stones throw of Shoal Creek. This one block subdivision still exists today as the block between 34th and 35th streets and Kerbey Lane and Mills Ave. On the William Thiele subdivision plat, West 35th street is labeled as the “Burnet County Road”. By the early 1900’s, the Burnet County Road had become known as State Street, perhaps because of the amount of property on the street owned by the State of Texas. Early subdivisions abutting “State Street” included Camp Mabry Heights (platted in 1913 in the northwestern corner of the neighborhood near the MoPac railroad tracks), and the Ed Seiders Subdivision, immediately to the west of the William Thiele subdivision. Camp Mabry Heights, obviously named because of its proximity to the National Guard armory, Camp Mabry, reflected a patriotic theme in its street names: Pershing St. and Funston St., named after American Generals Pershing and Funston, and Jefferson Ave, Harrison Ave and Madison Street named after United States presidents. The Ed Seiders subdivision references the proximity of the neighborhood to the old Seiders Spring, located on the banks of Shoal Creek near the present day Shoal Creek Hospital. Bridges were an important component to the development of the Bryker Woods neighborhood. Shoal Creek separates Bryker Woods from the downtown business district and the University. Prone to flooding, Shoal Creek was notorious for destroying bridges. Due to location, the Bryker Woods neighborhood was not developed until reliable bridges crossing Shoal Creek were constructed. Despite the concrete construction, the severe flooding of the past few decades has threatened the foundations of the many old bridges spanning Shoal Creek. Resubdivision of these early subdivisions began in 1925 when a portion of the Ed Seiders subdivision was replatted as the Glenview Addition. Two years later, the Edgemont subdivision (the area around Northwood Rd.) was created. In 1935 a portion of Camp Mabry Heights was resubdivided as Happy Hollow, so named by its developer Dr. “Hap” Brownlee. At about the same time at the southern end of the neighborhood, a subdivision named Summit Place and the third section of Pemberton Heights were platted. 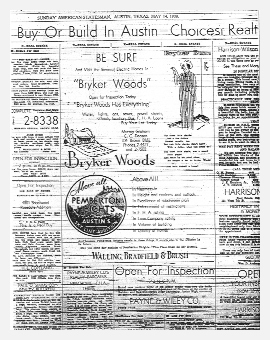 The first subdivision with the name “Bryker Woods” was platted in 1936. Its name is said to have been derived by combining the first three letters of the last names of two of its developers, J.C. Bryant and McFall Kerbey. Over the next 15 years, subdivisions labeled Bryker Woods “B” through “C” and Bryker Woods Annex 1 and 2 were platted. During this period the Woods Addition adjoining Bryker Woods School was platted, and the Westwood Ridge Addition (the area around Churchill Drive) was formed by resubdividing a portion of another of Mr. Seider’s subdivisions, “Seiders Plateau” in 1940. The final subdivisions in the neighborhood were the Belmont 1 and the Belmont 2 subdivisions formed in 1951 and 1955, respectively. Note that several of the subdivisions have deed restrictions. Land use in the neighborhood was, and has remained, predominantly residential. Essentially, the property on both sides of West 35th Street to the east and west of Jefferson was zoned “A” residential, except for the four comers of the intersection which were zoned “C” commercial. Commercial zoning was first expanded outside of this intersection in 1954 when two lots directly east of the intersection were granted “0” office zoning. Over the next 25 years, different lots between West 34th and West 35th streets (east of Jefferson) were unsystematically rezoned from residential to commercial zoning districts, primarily office; by 1981 approximately 60 percent of the lots in this three block area were nonresidential. Property along West 35th Street to the west of Jefferson evolved, into a mixture of single and multifamily residential, office and retail zoning. All or virtually all of this new zoning in the Bryker Woods area, was granted without recorded opposition from the surrounding landowners, even though much of it was demonstrably spot zoning. It is possible that this rezoning was encouraged early-on by the fact that the City’s transportation plan, in the late 1960’s, contemplated an expressway through the area. As described by a city planner in connection with a 1967 rezoning application: “There are two possible locations for the expressway, one is to the north of West 35th Street the other starts with the south right-of -way line of West 34th Street. The latter proposal is the one most planned around….” (Zoning Case C-14-67-215). Certainly, the relocation of Seton Hospital from the West Campus area to West 35th Street in the 1970’s played a role in the increased desire for office space near the hospital. Another factor was the opening of MoPac (Loop 1) in 1975 which made this area even more accessible. By the late 1970’s, the cumulative effects of the zoning changes, described above, began to be felt by the Bryker Woods neighborhood. Increased traffic on the streets around the homes and the elementary school and the destabilizing effect of land use changes signaled the need for greater scrutiny of rezoning requests than had been given in the past. Since that time, neighborhood residents and the City have carefully reviewed numerous requests for zoning changes in the neighborhood. Many of these applications have been denied by the City, and those that have been granted represented negotiated compromises with area residents. Significantly, the neighborhood to the south of West 34th Street remains completely residential.